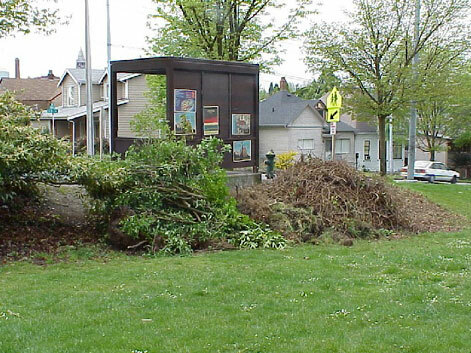 This year, our students decided to work on an area along the west side of the Garfield High School building. Our site was bordered by the school building to the west, 23rd Ave. to the east, and sidewalks to the north and south. The goal this year was to create a safer and more attractive open space that improved the connection between the school and a metro bus stop on 23rd. Since part of this site is used for frisbee playing, socializing, and other activities, we left a large grassy open area for such active uses. The sites we rehabilitated surrounded this open area, and included the beds around the bus stop and the planting strip along the building. A Garfield technology class also plans to formalize a social path between the bus stop and a school entrance, designing and installing a new pathway. Prior to renovation, the site consisted primarily of turf, which covered the planting beds. The beds nearest the bus stop were dominated by a thick patch of Hedera helix (English ivy) on one side, and Prunus laurocerasus (cherry laurel) on the other. A few trees and shrubs were planted throughout our project area; while some were healthy, several sickly specimens required replacement or removal. The site’s soils are sandy clay or sandy loam in texture with generally good drainage; lead levels are moderately high. Due to its western exposure, the site is usually sunny in summer afternoons, and partly shady in winter afternoons. New plantings were selected based on their ability to tolerate site conditions as well as blend with existing landscaping. Below are pictures of our site visits and weekly work parties (note that pictures from some weeks were lost in the arson at the Center for Urban Horticulture (pdf)). Click on any picture to see a larger version of the image. Assistance with mulching and weeding. Donation of $243 worth of plant material.